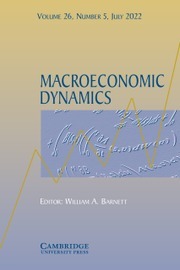 Macroeconomic Dynamics publishes theoretical, empirical or quantitative research of the highest standard. Papers are welcomed from all areas of macroeconomics and from all parts of the world. Major advances in macroeconomics without immediate policy applications will also be accepted, if they show potential for application in the future. Occasional book reviews, announcements, conference proceedings, special issues, interviews, dialogues, and surveys are also published.